The latest issue of Maxim (August 2008 issue) has an article on what they're calling the 2008 Maxim Food Awards. I skimmed through it and only found one restaurant out of probably a couple hundred that was from Massachusetts. 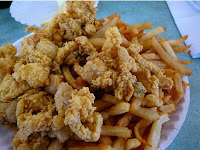 Local Ipswich clams fried to a perfect golden crunch, served atop a heart-healthy platter of fries and homestyle onion rings. Pardon my drool. This isn't the first time I've read about JT Farnhams. There was definitely another publication maybe Boston Magazine or Saveur or the Improper (I read too many mags) that mentioned JT's fried clams. Worst part of the story? I haven't been there yet - but that can be fixed. Who's in for a road trip? And for those that are curious, (here's) a lil comparison that I found on Chowhound comparing JT Farnham's to Woodman's with a few comments that were promoting a place called Clam Box. 1 Response to "JT Farnham Wins a Maxim Food Award"
We've been to JT Farnham, Clam Box and Woodman's a few times. Farnham has the best batter, best tartar sauce and don't forget their specialty fried cod cheeks (if still available). We love Clam Box the most but it has the longest waiting line :-( If you go to Woodman's, you must have their steamers, the best.